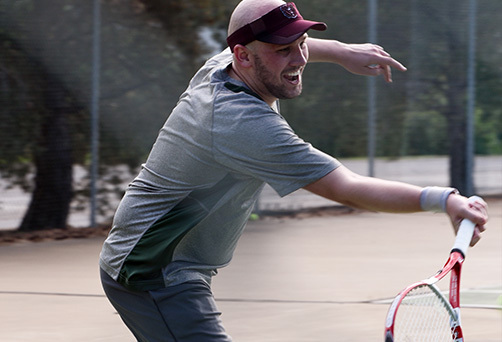 Seminary students are encouraged to participate in Concordia Seminary’s robust intramurals (IM) program. The program allows students, faculty, staff and spouses to participate in a wide variety of sports. Intramurals are a great way to relax and unwind after a long day of classes and studying. Whether you play sports or not, come out Tuesdays and Thursdays to enjoy some time together with the Seminary community. Any more that you can think of! Fall and spring sports take place on the campus field. Winter sports will always take place in Pederson Fieldhouse. Students, faculty, staff and spouses are encouraged to play (adult children are invited as well). This is typically a time for the “grown-ups” to play, but bring the kids out as a cheering section! Major sports are played on Tuesdays and Thursdays. Fall and spring games start at 4:30 p.m., Winter games start at 6 p.m.
Signups typically occur when classes begin in the fall. After the registration period, teams will be chosen for the entire year. Special registration periods may take place at other times throughout the year. You also can speak with the intramural director for assistance in special registration. Concordia Seminary is proud to sponsor intercollegiate teams in soccer, basketball, tennis, and golf, with all teams going by the name The Preachers.